Amplifunds is an early stage FinTech startup focused on improving the world of philanthropic donations. I’ve been working with the founder for the past year iterating on product strategies and designs to test our product/market fit with our target audiences, as well as building a product vision compelling for investors. The experience of Donor Advised Funds (DAFs), from messaging to design, incentivizes donors to build their money up in their accounts instead of donating it out of them. While nearly 70% of Americans donate (248M people that gave $272B last year), just 0.1% of the highest net-worth donors have access to advisory and donation management tools. The vast majority of donors end up doing their own research via confusing IRS databases, incomplete nonprofit reports and third-party resources – or doing nothing at all. Many DAFs are run by financial institutions foundations where tech is not a core competency or priority. Donors who manage to overcome the problems above experience outdated, unappealing and confusing interfaces. The following are the hypotheses we’ve worked through and the learnings from them. Providing donors with recommendations will empower them to donate with confidence. These recommendations will be based on their interests, donation activity from their friends and contacts, and selections curated by philanthropic experts. To test this, I created a prototype that would take users from their existing DAF account into the Amplifunds interface. In the prototype, users would go through a personalization flow that surfaced suggestions based on the donations of other members of their financial institution. Note: These images show the startup's previous name, goodMatch. Main goodMatch page, before any personalization. We included a step to connect their social media accounts. We would use this to layer in friends and contacts from those accounts that were connected to charities matching their preferences. The combination of preferences with matches in their networks would rank charities the highest. The prototype also included charities curated by a philanthropic expert, and the prototype introduced the expert and explained his expertise. Since the expert had nothing to do with the user’s preferences or network, we gave this feature the lowest priority. Donors almost unanimously were not interested in the donation activity of other members of their financial institutions. Financial institutions are large, so perhaps users did not view this as a community. Donors found no value in knowing which charities their social media contacts were donating to. This came as a surprise to us since the pain point of “not knowing what my peers are donating to” was very common in research interviews. The selection curated by the expert gathered the most attention and positive reception. Even though we had assigned this feature a low priority, testers wanted that same approach of expert insights about the impact areas they were interested in. Integrating into DAF portals was not viable at this stage. Our strategy of "going where the donors are already" relied on being integrated with a DAF portal but we found insufficient interest from partners, not to mention the huge effort required to integrate our technology into existing DAF portals. Providing donors with recommendations curated by philanthropic experts, related to impact areas they’re interested in, will empower them to donate with confidence. 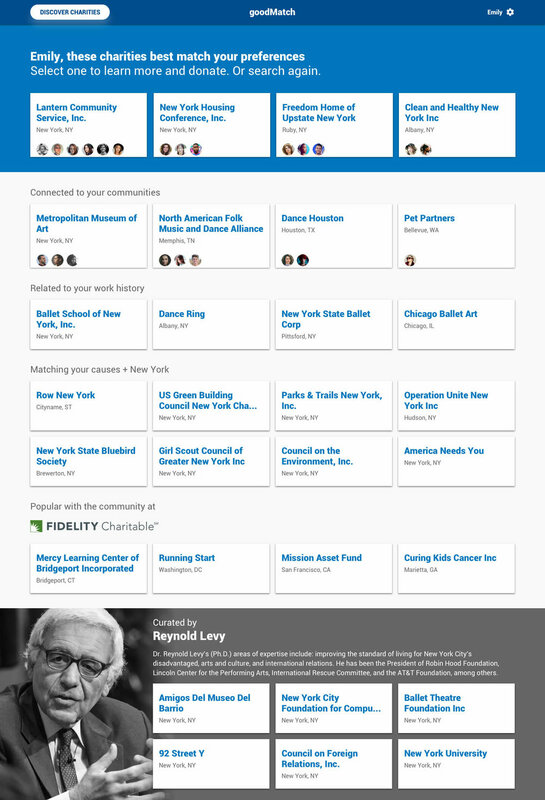 Next, I mocked up a standalone site where donors could browse relevant impact areas and donate to a portfolio of charities that was curated by our experts. Since donors could just pick one of the charities presented by the curators and donate directly and avoid our fee, we gathered the curator’s picks into a portfolio where money donated would be spread equally between the charities in it. This time we used an even larger pool of participants and collected feedback on the site, besides doing in person tests and interviews. We also ran marketing tests to gauge interest in our value prop and messaging. Curators did not like being secondary to the causes, nor to be placed at the same level of expertise as less experienced curators. We addressed the first issue by making the impact areas secondary to the curators. We also added flair next to curators so we could differentiate them. Visitors were seldom ready to donate. This launched us into a new research initiative where we learned that it took a long time to build trust with curated recommendations before donating. Unlike our first prototype, where donors were already in their portals and ready to give, our visitors were here for research, not necessarily to donate. Visitors did now know our brand. We needed to explain more how Amplifunds worked. To build trust, we needed to leverage our expert advisors who come from well known financial institutions. We did not have enough content. We added a component to capture impact areas our audience was interested in, which we then used to inform curators of where demand for portfolios existed. That previous version of the product addressed the problem of lack of guidance, and the frustrating experience but only for credit card donors – DAF donors couldn’t donate directly from their accounts because we didn’t have that technology yet. We needed to do more to tackle the problems of the money being stuck in accounts. We dug into back into financial behavioral science research and insights for our next hypothesis. Providing donors with a visualized record of their impact, that frames funds donated as positive, and allowing them to donate with their DAF account, will empower them to donate with confidence. This latest hypothesis is still in early stages as we ramp up back end implementation to test with real users. In addition, we’re integrating the ability for donors to both sign up and donate with their DAF accounts, which will open the door for Amplifunds to provide a frictionless donation experience.